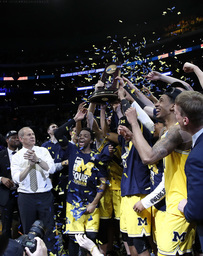 Moe Wagner climbed the ladder, snipped the final strand and whipped the net around his head while thousands of Michigan's West Coast fans roared. The first half wasn't pretty, and Michigan took a 27-26 lead into the break despite failing to get a field goal in the final 5:45. Florida State managed only two points in a 10 1/2-minute stretch spanning halftime, and Michigan took a 10-point lead before Cofer led the Seminoles back into it.